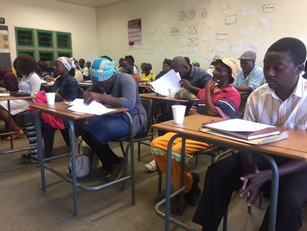 On Thursday 25th May 2017, ERP held workshops at Kekana Gardens with the local business entities together with the informal waste collectors in the area. The purpose of the workshop was to give all parties an understanding of how ERP works and to gain buy from the community on the different interventions we would want to introduce in the area. In attendance were over 50 participants including officials from SANCO, the City of Tshwane and SMMEs spread over a number of economic development spheres from within Kekana Gardens. We gave the participants an insight on ERP and how the P.E.A.C.E. model works. There was great interest in our activities, from the hubs to agriculture and waste management. We went through the business evaluation questionnaire together with the recycling one. Present were also two ladies from the City Of Tshwane, and one of them was interested in the waste management initiative. We gave all participants their respective questionnaires and asked SANCO to ensure they are all filled in by Wednesday, 31st May. By the time we left, they were already helping some waste collectors fill in the questionnaires since most of them have low literacy levels. However, most business owners showed higher levels of literacy and some could be seen already filling in the questionnaires by themselves. During the workshop, one of the crafters indicated that they were keen to engage with the collectors as they make use of some of the materials in their crafts work. This still works perfectly as they are able to upcycle some of the products thereby enhancing the recycling value chain. This will be something we would need to ensure happens and perhaps we could then replicate something similar at Thinana. When we went through to the crafters, my conversations with Isabel over the past months came to mind, particularly with regards to bead work and other items which can be marketed on ERP Mercantile. This can address some of their challenges with regards to accessing markets. They seem to create great products. After the workshop we had a meeting with the Crafters’ cooperative (both the production & marketing cooperatives) to give them an update of the progress update regarding the proposed concept. See concept drawing below of production factory that would be built next to the current building to provide proper space for the crafters to work in. The manufacturing factory would be set up to the right of the current building where the parking areas is. The public would be able to interact with the crafters as they work. The idea is to move the crafters from the 3 small rooms on the left of the building and retrofit those rooms into to a 2-roomed IT centre with a training room and computer/internet centre. Arthur is going to send us cost estimates for the proposed redevelopment. On 4 May 2017 one laptop each was handed over to head masters at Steve Biko High School and Refilwe Primary School. The laptops were received from RB pharmaceutical through ERP. ERP sponsored the Science Expo at Kwalata Game Reserve, located within the Dinokeng Game Reserve. Over 1600 students from primary and high schools in Hammanskraal and Kekana Gardens came through the Expo over a 3 day period from 22 to25 May 2017. ERP had a stand and staff presented to groups of 50+ at a time over the 3 days. The focus was on the work being done in DGR and the adjacent community many of the children come from.